The NYT is generally viewed as pro-Israel, pro-Jewish, etc. so, when someone provides them generously with a sophisticated, cogent and deep argument supporting their general somewhat Zionist position, one would guess they would be enthusiastic. Instead, they sent my long comment to Hades, as if it were a piece of Nazi propaganda. Stupidity has no bounds, even self-preservation doesn’t get in the way of reasoned idiocy. Better die content and stupid, than sad and smart, say the chicken and they cackle, self-admiring. Patrice Ayme: Indeed. Stupidity is certainly contagious, because the most energy laden activity is creative thinking. Thus, the most efficient way to save energy is by thinking as the sheep does, that is by pure duplication: follow the leader, typically another sheep, or then a meat-eating sheperd. Not following the rest of the sheep is not just energy expensive, it is uncomfortable, scary and dangerous. Only fools or philosophers will engage in it. Paradoxically, those obsessed by self-care should opine that, to think like a sheep is superior. Superior thinking is often just about superiority, not care. … the ultimate insanity. 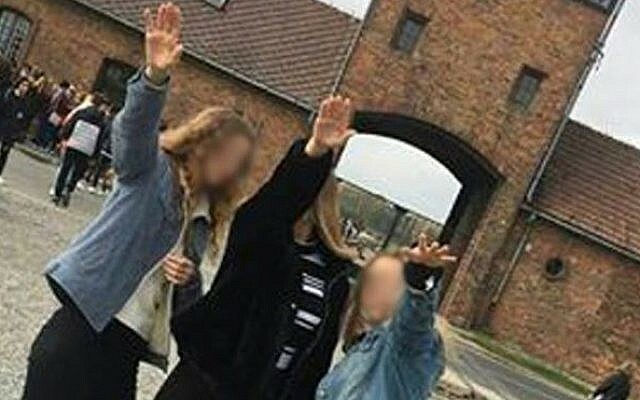 These three blonde idiots, teenagers from Poland, don’t even know that, according to Nazi doctrine, they were (probably) subhuman Slavs, and that Auschwitz was actually initially created to mass destroy Poles. There was a deliberate Polish extermination program, launched as early as Fall 1939. The extermination of the Jews was launched much later (after the Fall of France). Thousands of dark-haired Nazis assassinated hundreds of thousands of blonde Slavs, French and Jews… Officially from their self-contradictory racism, but truly from their fully unhinged Darkest Side. Meanwhile, the Auschwitz-Birkenau Memorial and Museum has just implored visitors to respect the memories of the 1.1 million people who were killed at the extermination camp — and not to balance on the train tracks, being pictured with beaming smile and two thumbs up at the entrance of the extermination camp, etc..
Decency and respect are in short supply nowadays. It’s as if these notions ceased to exist. Instead snowflakes cry as soon as the heat of critique shines upon them. Considering Nazism for what it was, a monstrous infamy, not a joke, is a duty, to be accomplished with thorough respect to the victims. Engaging in lack of respect for the victims is exactly repeating how the Nazis launched themselves, mimicking exactly what the Nazis did! Stupidity by mimicking the herd doesn’t just economize effort. Stupidity is also selfish in other ways than plain brain economics. Stupidity by following the herd’s moods, emotions and ideas is also the key to power. Power sharing. One charging buffalo amounts to little; a herd of charging buffaloes is everything. Thus a key to truly modern morality and probity is to refuse to follow the herd, as a matter of principle, in first approximation. Instead the mood of old fashion education has been the exact opposite, as youth is driven, like cattle, through a succession of rituals to pound into their thick skulls how they are supposed to behave, feel, and think. Why? Old fashion education was made to support empire, empire the old fashion way, the gun boat style, or Kaiser style, or Lenin-Stalin way. Old fashion imperialism needed minds fit for that mission, minds all made in the same way. Minds who know how to go to the ball, get drunk, and don’t think too deep. The requirements of civilization are now the exact opposite. The danger now is that as never before have the mental requirement been higher, because the Sixth Mass Extinction is fully engaged, and the thermonuclear gods are watching. Young people should ask themselves why they are asked to do what they are asked to do. Starting with vaping, dating, celebrities, posing, prancing around, and believing goofing around in a socially acceptable way is the ultimate. Go to Auschwitz, you the naive and ignorant and learn that considering Hitler and his 80 million cretinous, vicious followers unbeknownst to themselves, is an excellent beginning of the conversation of humanity as it is, with itself.